There is no better way to give the gift of Christmas charm than with a warm and cozy Christmas patterned gift wrap. When picking your patterns, think about what the holidays mean to you. Do the holidays mean bundling up under a plaid blanket binge-watching Christmas classics? Maybe it’s romping around in the snow or decorating a freshly cut pine tree. Or maybe it’s making delicious peppermint bark and cookies for you and the family as you wait up for Santa. 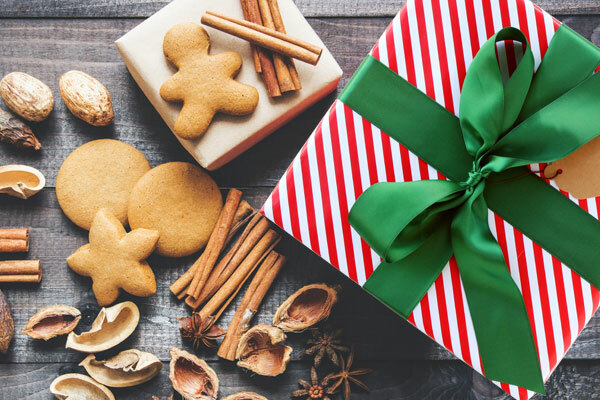 Whatever it is, let these traditions guide your gift wrap pattern choices this season. Us? We’re suckers for a minty fresh peppermint candy cane. It’s the flavor of Christmas! If you agree, then we recommend this Red / White Christmas Striped Gift Wrap. FYI: For more classic holiday patterns like plaid, snowflakes, or trees check out our Christmas Gift Wrap Collection. To break up the repeating pattern and bring a little contrast, we love the soft and smooth texture of satin. Here, we kept the look timeless with a lush Forest Green Satin Ribbon. FYI: For a wide range of well-loved holiday prints and patterns, check out our Christmas Ribbons Collection. Personalize and label your present with a blank gift tag made of premium Kraft paper. Kraft is one of our favorite eco-friendly materials because of its versatility and natural look. On hand, we always keep a package of Unstrung Kraft Gift Tags.